The weather is warming up, which means it’s time to stick our hands in the soil and get planting. 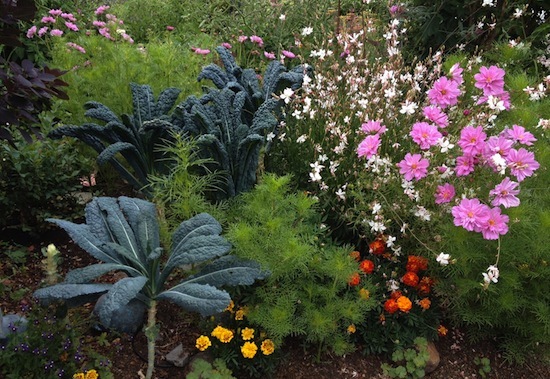 We asked UC Master Gardeners Sue Lovelace and Susan Foley and urban homesteader Melissa Keyser for their best spring gardening tips. Plant a large variety of plants that bloom at different times of the year. Include natives as they are the best source of nectar and pollen for native bees, plus they are adapted to our local soils and climates and demand little water and zero fertilizers. 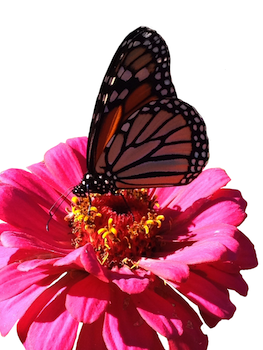 Create a list of colorful plants rich in nectar and pollen. Consider asters, buckwheat, ceanothus, sedum “Autumn Joy,” zinnias, verbena, scabiosa, yarrow, or California fescue. Hummingbirds will delight in Toyon, flowering currants, California fuchsia, penstemon, tithonia, coreopsis, sage, Red-hot Poker, and other bright-colored tubular or flat flowers. Plant the same species together in large blocks. Plant butterfly host plants such as native milkweeds (Monarch), fennel (Anise Swallowtail), and coffeeberry (Pale Swallowtail and Gray Hairstreak). Leave bare patches of dirt, old stumps, and hollow branches for native bees to nest in. Provide a shallow dish or birdbath with rocks for landing. Do not use pesticides. Even those marked organic can kill beneficial insects. There is nothing like growing your own food. Spring, when the thermometer hovers between 55 and 75 degrees, is a great time to grow and eat cool weather vegetables like carrots, radishes, kale, arugula, chard, green onions, and leeks. It’s also a good time to plant warm weather veggies that thrive in temperatures between 65 and 95 degrees. When planning your garden, keep it simple. First, think about what you like to eat. Then, list whether these are cool or warm weather vegetables. That will help you determine the optimal time to plant. Remember: Warm weather veggies shouldn’t be planted until a couple of weeks after the last frost, usually the end of April or the first part of May. So hold off on those tomatoes! Before jumping in, make sure to complete a site assessment for these three factors: location, soil, and water. Location: Your vegetable garden requires six to eight hours of sun. Decide whether your garden will do best either in the ground, in a raised bed, in containers, or the front yard. Make sure your garden is free of debris, overhanging branches, and away from foot traffic. Try to plant close to the kitchen for easy access. Soil: Well-drained, nutrient-rich soil is vital for growing vegetables. The magic ingredient: compost! For a first time garden, dig three to four inches of quality, organic compost into the top three to eight inches of soil. This is the active rooting zone for most vegetables. If you are filling a bed for the first time, use a compost-dense, organic planting mix. These mixes can be purchased in bulk or by the bag at local landscape companies. Be prepared to create barriers against known pests. For example, you might line the bottom of a raised planter with hardware cloth to block out gophers. Water: Drip irrigation is the most efficient way to deliver water directly to the active rooting zone. You can also obtain this effect by watering around the base of the plant but not directly on the foliage. Stick a chopstick or even your finger, near the roots to detect whether you are watering too much or not enough. Before planting, aim to have drip irrigation in place and locate the garden near a faucet. Make sure soil is moist but not soaking wet. After assessing for the three factors, it’s time to start planting. You can purchase seedlings or starts from a local nursery. Braver souls might plant seeds directly into the garden. Peas, salad greens, beets, carrots, and radishes do well with direct planting. Kale, broccoli, Swiss chard, cabbage, leeks, and dill do better as starts. Vegetables to be planted when the weather warms up can be started from seed indoors now. Make sure to keep your seedlings in a warm, sunny spot indoors, under a grow light or in a greenhouse. Once these seedlings get their first leaves, go ahead and “prick” them out and transplant to a bigger pot. Next, gradually introduce them to outside temperatures before planting in the soil. Plants to consider for direct planting in the ground are beans, corn, squash, cucumbers and melons. Tomatoes, peppers, marigolds, zinnias, and eggplant are best planted as seedlings. After planting, be sure to lay mulch—straw, dried leaves, or compost—around the base of your plants. Do not put mulch around the crowns as this can cause rot. Mulch keeps moisture in and weeds down. Observe your plants for signs of pest, water, or weather damage and prepare to protect them with row covers, bird netting, or frost blankets. You may also need to pick off snails, slugs, and caterpillars. Most importantly, enjoy your garden and the “fruits” of your labor! Most homeowners have very little knowledge of the water needs of their landscape plants unless they have re-landscaped and chosen the plants. The majority of us have bought properties with existing plants and irrigation systems, many of which are outdated. Consequently, studies have shown that 40 to 50 percent of water applied to landscapes is wasted and does not reach the root zone or even benefit the plants. So, let’s begin with some irrigation tips . . . If your irrigation system is more than eight to 10 years old, try replacing your old controller with a  higher tech one to improve water savings. Consider adding a wireless weather sensor, which will monitor your microclimate and send the data back to the controller, taking the guesswork out of how much to water. An excellent baseline for understanding how much supplemental water plants need throughout the irrigation season is available through the City of Santa Rosa WaterSmart program. If you are using spray irrigation for mature beds of shrubs and perennials, convert it to drip irrigation and use inline emitter tubing snaked through the planting beds in an approximate grid, which will wet all of the soil underground. If you have lawn, consider removing some or all of it, as a green lawn requires more water than any other type of plant. Most municipalities in Sonoma County have lawn rebate programs to help with the cost. Drip irrigation is the most efficient type of irrigation. To select the proper drip rate, you need to know what type of soil you have. Information and videos about simple tests to help you determine your soil type, such as the Soil Ribbon Test and the Mason Jar Soil Test, are available online. Clay soil, which is common in much of Sonoma County, takes up water very slowly, so low volume emitters (1/2 or 1/4 gallon per hour) should be used. Sandy loam, which is common in the West County and areas adjacent to waterways, takes up water quickly, so higher volume emitters (1 or 2 gallon per hour) can be used. Because they drain quickly, sandy soils require more frequent irrigation than clay soils, which drain very slowly. If you don’t have underground piping on your property, you can still install drip irrigation by utilizing hose bib timers that run on batteries and feature many of the automatic and cycled options found on the large irrigation controllers. These can be especially handy when installing raised vegetable beds, so that you can put inline emitter tubing in the beds to keep the soil for edibles evenly moist. For those with existing drip irrigation, be sure to do your spring maintenance before you start your irrigation system for the season. For different irrigation line, remove and clean the filter at the valve, then open up the end cap, turn on the valve, and flush the line. Then re-cap the line, turn on the valve, look and listen for leaks and/or breaks in the line, and repair any that you find. Keep in mind that as your plants grow, their root systems grow as well, usually matching the canopy of the plant. So if you installed one emitter at the stem of the plant when it was small, you will need to add additional emitters as it grows and place them between the stem (or trunk) and the canopy. Making changes to the irrigation system can be easier than redoing the plant material on our properties. Many of us inherited Asian plants, especially if the home was built between the 1950s and the 1980s. Mature specimens can be quite drought tolerant, but even today many of the common landscape plants that are available hail from Asia and are rated as moderate water-use plants. Check the water-use rating of the existing plants in your garden at ucanr.edu/sites/WUCOLS, which stands for “Water Use Classification of Landscape Species.” Sonoma County is in Region 1, the North Central Coast. This rating is important to know as you choose and add new plants to your garden. Keep in mind the principle of “hydrozoning.” Simply put, this means putting plants with similar water needs together in the same planting bed on the same irrigation valve. Proper hydrozoning is important because when we mix plants that have different water needs, most of us irrigate to the highest water need plant, which results in overwatering the other plants. While many plants will tolerate the additional water, they don’t actually need it, and some plants that require good soil oxygen may actually drown if the soil is constantly wet. Another important design aspect of hydrozoning for our summer-dry climate is the concept of an oasis zone. Place your thirsty, lush plants around patios, decks, and entryways, where you will see and enjoy them. The rest of your property would ideally be comprised of Mediterranean plants and lowwater use California natives, both of which require little to no irrigation once established. These plants also require little care and maintenance, and so are great for those out-of-the-way areas that we often overlook. I depend on perennial plants to supply my garden with interest year-round. Unlike annuals, perennials can grow dependably over several years, and most bloom repeatedly. Some are known as tender perennials and will die back to the ground with the first frost, but they come back each spring. Others can stand the cold and rain and provide a great backbone to the garden during those soggy months. Given the right care and the proper environment, most perennials will reward you for years to come. In my garden, I have high expectations for my plants. I require them to do more than just look pretty. They must feed the bees or the birds, be turned into medicine, attract beneficial insects, or provide some other magical feat. If you’re wanting to add some perennials to your garden this spring, here are my top five picks for Sonoma County. 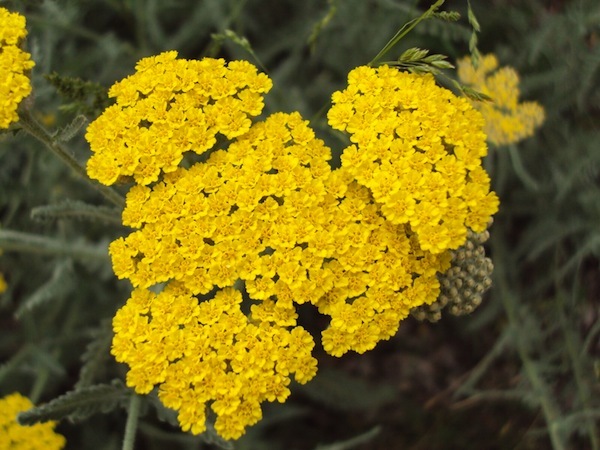 1 | Yarrow – Achillea sp. When I moved from an apartment garden to a house in Santa Rosa, I dug up and took many of my plants with me. Fast forward a few months later, I finally planted them, but most of them had died thanks to sitting in a pot for too long or haphazard watering. All except for my yarrow. Two years later, forgotten in a back corner, the yarrow still bloomed. This plant is a staple in my gardens. I’m partial to the classic yellow or white blooms, but there are also brilliant shades of salmon, pink, and coral. The tiny flowers that make up the flowerheads are perfect for feeding and attracting small, beneficial insects. Artichokes are my favorite vegetable, but even if I wasn’t partial to the edible part, I’d still grow them for their plant appeal. It’s a perennial vegetable, so you only need to plant it once for years of production. With large silver gray jagged leaves, this structural plant is one that can pass as a veggie or a landscape plant. I like planting as an understory to fruit trees, but it’s also great in a modern or a cottage garden landscape. 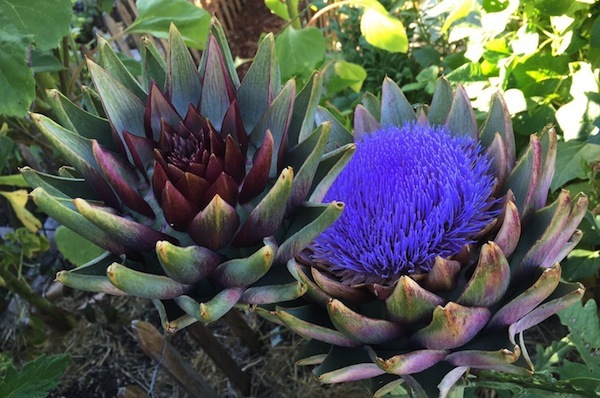 In the spring, you’ll be rewarded with delicious artichokes, which are actually the buds of the flower. If left unpicked, they unfold into neon purple pincushion flowers that the bees just love. This family of plants does well in Sonoma County. You’re probably familiar with catnip, the elusive kitty drug that causes carpet licking or frantic run-abouts, but catnip is also an herb for humans, used in teas for sleep. The plant produces clusters of lilac flowers that the bees go crazy for, and in the fall, finches arrive to eat the seeds. If you don’t want to attract the neighborhood cats, try catmint. 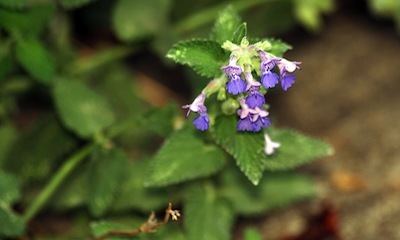 These landscape plants grow in the same conditions as catnip: full sun, low water, and a high tolerance for crappy soil. In the spring and summer, small lavender flowers provide forage for bees. Say hello to a Sonoma County superstar! Rosemary comes in many different varieties, from those that create big hedges to the low ones that crawl on the ground or trail over walls. All are edible. And they all produce purple flowers in winter and early spring. This herb offers great structure and greenery to the garden, particularly in winter when other plants have withered and gone dormant. 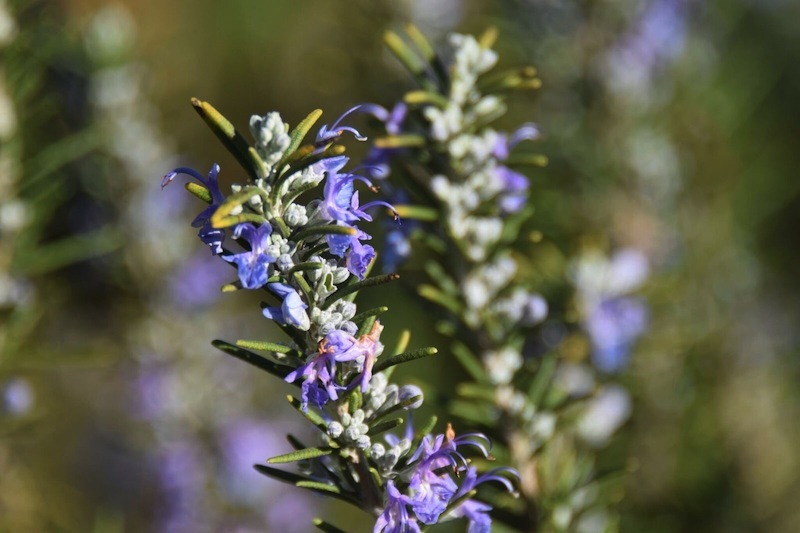 It is also an important winter forage plant for honeybees, and on those occasional warm days, your rosemary bushes will be singing from the buzz of bees. I’ve mentioned lots of purple flowers, but what if you want some other colors in the garden? Look to the salvias which come in purples, pinks, and reds. 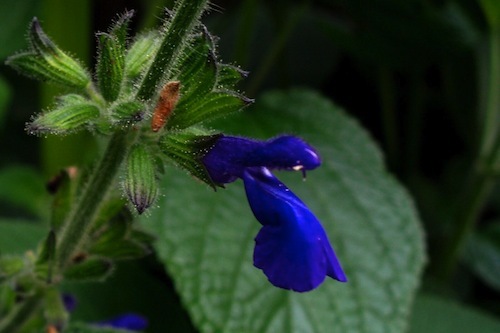 There are about a billion different types, but my favorite is Salvia greggii. With an open, airy bush form, the tiny red, white, or pink flowers bloom summer to fall. The hummingbirds go crazy for these, and I love watching the fat carpenter bees wiggle their way in to get the nectar. Drought tolerant and easy to grow, I love pairing the red S. greggii with yellow yarrow.